That’s pretty gross, but on the plus side, they apparently get you high. 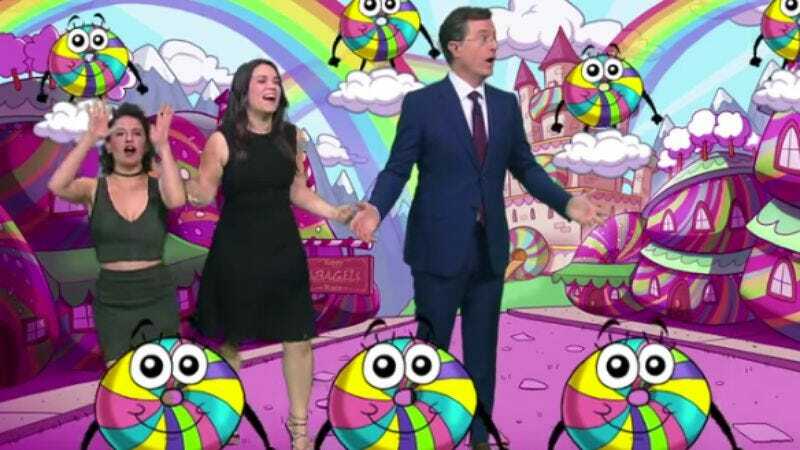 One bite sends the trio to a magical, multicolored cartoon kingdom populated by happy rainbow “bagel babies,” which happen to sound just like Bingo Bronson in Broad City’s famous “Wisdom Teeth” episode. But there’s an evil ”bagel king” to be defeated—that just how these things go—before Colbert and the gang can return to the studio. It’s a silly, surreal bit, the kind of high-concept segment that has made Colbert stand out from his late-night peers. And then Lucinda Williams sang a song about being too empty inside to cry, because that’s just how things go with her.